The 3.5" Huntsman includes everything needed by the avid outdoorsman and the everyday user. Outfitted with blades, scissors and screwdrivers, the Huntsman is a complete pocket tool in a compact design. Versatile enough to be used around the house as well as in the great outdoors, the Huntsman Victorinox Swiss Army Knife features 13 tools and is 5 star rated. The perfect companion for anyone. The 3.5" Huntsman includes everything needed by the avid outdoorsman and the everyday user. Outfitted with blades, scissors and screwdrivers, the Huntsman is a complete pocket tool in a compact design. Versatile enough to be used around the house as well as in the great outdoors, the Huntsman Victorinox Swiss Army Knife features 13 tools and is 5 star rated. The perfect companion for anyone. 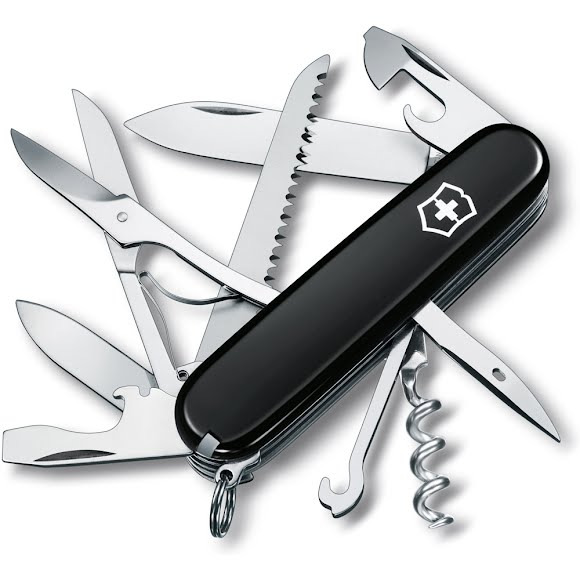 All Swiss Army Knives carry a lifetime warranty, stainless steel implements and unsurpassed quality and functionality. Dimensions 3.5" x 1" x 0.8"